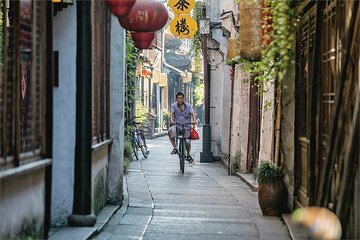 Avoid the rigid and impersonal experience of a large group tour with this private guided tour from Shanghai to Suzhou and the water village of Zhouzhuang. In the company of just your party and a guide, explore only the sites that you are interested in and enjoy a relaxing boat ride through Zhouzhuang. Alana was an incredible tour guide for our day tour of Suzhou and Zhouzhuang. She was kind, funny, caring and very go-with-the-flow. We appreciated that the tour was not too rigid and allowed us to explore both towns with some spontaneity. It was comforting to have an English speaking guide who we could easily communicate with. We were able to see so many sites in one short day and experience much of the culture. We enjoyed a delicious authentic meal where we got to sample multiple tasty local dishes. Alana went over and above to ensure our day was perfect. We highly recommend this tour via Viator and Alana as a guide.